The business of Engel & Völkers, the leading German real estate brokerage in the world, recorded a 36.5% growth in Spain, Portugal and Andorra during the year 2017. The company brokered real estate worth 1,945 million euros compared to the 1,425 million euros recorded in 2016. The Iberian Peninsula, together with the Balearic and Canary Islands, has become a strategic region for the German real estate agency. In Spain alone, the company made a total of 2,790 sales transactions during the past year, which is 24% more than those registered in 2016. The average price of purchase transactions rose by 10% to stand at 660,000 euros. With regard to the rental market, the number of homes that the firm managed in Spain increased by 20% to 2,673 cases. In total, the Engel & Völkers group managed to increase its turnover by 31.9% in 2017 to reach 667.8 million euros. This represents a new world record for the company. "In 2017 we have managed to expand significantly and once again our position in the international real estate markets has been affirmed," says the founder and CEO of Engel & Völkers, Christian Völkers. North America has generated the highest growth in the world in terms of turnover in the residential division by rising to 54.6%. The reason for this good performance has been due to the opening of a large number of new property shops in the most sought after areas as well as first and second home markets. In Italy, Engel & Völkers continues its path of expansion and growth with an increase in turnover of 47.2%, as well as in the DACH region (Germany, Austria and Switzerland) where the real estate agency increased its income from commissions by up to 10.6% compared to 2016. The division dedicated to brokering commercial assets in the tertiary sector has also played a major part in the company's financial growth in 2017. With a 35% increase in its turnover, the commercial division benefited from the high demand from investors in flats and offices as well as residential real estate assets. These investment properties accounted for around three quarters of the total turnover in the commercial division. More than 10,000 people are currently work under the Engel & Völkers brand. 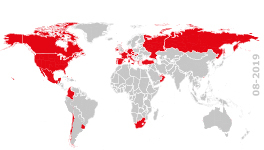 The company currently has an international presence in 800 locations. Looking forward to 2018, it expects to continue with its expansion process and plans to open 50 new locations around the world. This will bring with it a greater need for qualified personnel. "This year we intend to recruit more than 1,100 new real estate consultants," says Christian Völkers, the CEO of Engel & Völkers.